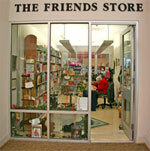 The Friends' Store is located on the first floor of the Eastbank Regional Library, 4747 West Napoleon Avenue in Metairie, one block west of Clearview Parkway. The store, open year round, has small gift items, postcards, stationery, records and previously owned books, all at very attractive prices. Come visit us today and browse hundreds of books and other items at bargain prices!